Whether from storm damage, fire/flooding, or a baseball, Goldfinch Brothers, Inc. is your one-stop friend for window repair and glass repair. With 124 years of window glass replacement experience, we have seen it all and repaired it all. Our employees are fast, agile and effective in providing top quality window repair services and products for all our customers. Being a company that is over a century old doesn’t mean we are behind the times, either. For example, we offer energy efficient windows that use modern Low-e glass technology. Our fully staffed team is up to date as well, our window installers receive ongoing training to remain current with all the latest materials and techniques. It won’t take you long to see that our Quality Assurance runs from start to finish – from your selection of window glass through production and delivery, and complete window installation, our customers will receive the best in both customer service and outstanding products. Here at Goldfinch Brothers, we take your window projects to heart. We will respect both your time and your property as we repair whatever damage may exist. 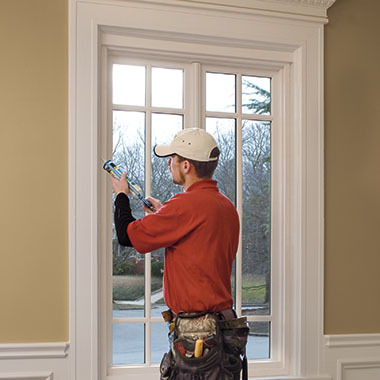 Our installers are AAMA certified and knowledgeable in code requirements, green building processes, water management techniques and skilled at energy efficient solutions for any and all needed window and glass repairs. We do all types of repairs for glass, windows and doors, including made-to-order specialty items and obscure glass. If we can’t manufacture it, we have vendors who can. They, too, will be up-to-date in all code requirements, the latest manufacturing technology, materials and energy efficient window solutions. Feel free to contact us – online, on the phone or in person at our showroom – you will be glad you did!